I admit it. One of the many facets of my geekdom is being an IMDB nerd. I can't ever just look at one page when I go to the site. I always get a kick out of finding somebody that surprises me in a television show or movie. Usually, this means I watch something old and see somebody in it before they became famous. It is even better if I did remember they were in it once they became famous. Some of these include Teri Hatcher, Ashley Judd and Famke Janssen all appearing on Star Trek: The Next Generation very early in their careers and Tobey Maguire getting one of his first acting credits on the old HBO comedy First and 10. What brought this to mind is something I've mentioned on other threads. I recently bought a set with the entire series of The West Wing and I'm watching it all the way through from the pilot. I just started season four. Amy Adams was in the season premiere and Danica McKeller was in a few episodes. That also led me to a reminder that Martin Sheen played a key role in Spawn a couple of years before The West Wing. It takes a lot for him to give a bad performance, but that shitshow managed to make it happen. So, got any good obscure appearances of actors and actresses before they were famous? Or after their fame faded? The all-timer for me is Jane Krakowski in Vacation. --Quentin Tarantino in Golden Girls as an "Elvis"
MASH had a few good ones, too, including Rita Wilson, Teri Garr and Patrick Swayze. MASH had some great ones. Swayze's was a memorable one, but my favorite was George Wendt (pre-Cheers) and Andrew Clay (pre-"Dice" persona) in the same episode. Christine Baranski as one of Marcia's slumber-party friends on the Brady Bunch. As told to me onthis site on an earlier thread, Jeremy Sisto as the guitar-playing kid in the "We're Not Gonna Take It" music video. Nick Offerman was in the first "block of cheese" episode on West Wing. He was part of the group who met with CJ about the all-wolf highway. Nicolas Cage in "Fast Times at Ridgemont High," credited as "Nicolas Coppola." Andrew Lincoln in Love, Actually. Never watched that movie until after I started watching The Walking Dead, so it was kind of jarring. "It's odiously odiferous olfactory emanations." 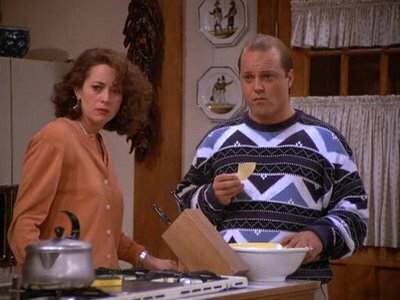 Always loved the whoremongering Michael Chiklis on an early episode of Seinfeld. The girl who brings the Baby Ruth to the pool in Caddyshack plays Marty Funkhauser's wife on Curb Your Enthusiasm. Anna Gunn was Jerry's girlfriend who wanted him to buy an air conditioner. Jennifer Coolidge (Stiffler's mom) was Jerry's girlfriend who wouldn't give him a massage. Jon Favreau was Eric the Clown. Kristin Davis was Jerry's girlfriend whose toothbrush he dropped in the toilet. And I think everyone knows that Bryan Cranston was dentist Dr. Tim Whatley.